These SINEX equipments are used for e extracting bulk materials and powdery materials from the hoppers. They are useful for feeding and dosing with a low flow rate. Options: Open or sealed equipments, with or without coating. Advantages: constant volumetric flow, continuously adjustable by potentiometer. The flow can be programmed or controlled by different SINEX electronic devices by a 4-20 mA or 0-10 V analogue input. 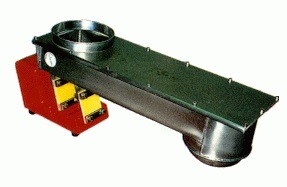 An amplitude sensor can be fitted. Low power consumption and maintenance free (no friction parts).